Hailing from Gurnee, Illinois keyboard wizard Brian Simpson combines a masterful control of his instrument with a keen sense of the catchy melody. As popular musician at countless festivals and also very welcomed accompanist he will not be forgotten. 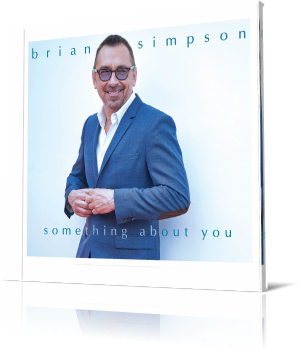 Your personal every day Brian Simpson is now available with Something About You, released July 27, 2018 on Shanachie Entertainment. Brian performs piano and keyboards. In addition he is supported by Alex All (bass), Darrell Crooks (guitar), Ramon Yslas (percussion) and guest musicians Ron King (trumpet), Andre Berry (bass), Oliver Wendell (keyboards, producer) and Yarone Levy (guitar). Steve Oliver created the programming and also produced the album. Brian enters the album with the title song. The decisive sound moment that drives you addicted unfolds without much difficulty. Morning Samba runs on the same principle. In quick succession the notes of the piano overtake you and leave you no chance to escape the hooky pull. Mojave is the driest desert and that means something in our global drought. Brian's song doesn't come across as dry. Yarone Levy on acoustic guitar and Brian on piano are two permanently sparkling sources of lust for life. When the first notes of Chemistry remind you of Gershwin's Summertime, it only serves as a stimulus. Ron King on muted trumpet and Brian Simpson on well-tempered piano swinging on Alex All's bass wave are good alternatives. Blue Horizon is based on the cooperation with keyboardist Oliver Wendell, with whom Brian has already played on the albums Just What You Need and South Beach. Stylistically, his music tends towards spherical New Age music. But Brian provides the necessary counterweight with his enticing contemporary groove. At First Sight is the most important impression music leaves behind. Brian and his team are doing everything right. Irresistible is the aptly title of Brian's second work with guitarist Yarone Levy. Oliver Wendell provides an impressive keyboard environment. Gotta Get To You shines with a blessed combination of Brian's airy piano and Oliver Wendell's spherical keyboards reflection. The emotional ballade Speechless gives the listener enough time to develop beauty and pleasure. Ron King returns with his muted trumpet on the final The Rainbow evocatively echoed by Brian on piano. Brian Simpson creates with Something About You a relaxing oasis of well-being. The music is streamlined and round like a bowl. Brian's passion for what he do is his natural base of success.